A garden shed is an important component of your garden and can be used either to store equipment or as a work space for certain tasks. But despite its importance in a garden, many sheds seem to get the short end of the stick, and often tend to become used for dumping unwanted stuff that homeowners don’t want in their home or in their garage. Garden sheds are often secluded to parts of the property that homeowners don’t want their guests to see, and left there to disintegrate. But this will only happen if the shed you have in your home isn’t the right kind. Here is your guide to choosing the right kind of shed that will give you the most bang for buck and make you proud when you look at it. The very first item you need to do in order to choosing the right kind of shed is to determine how you plan to use it. If you are planning on using your shed all the time, you may require more pathways, paving, and work areas than you normally would. Similarly, you may want to locate your shed closer to your main house or in a more centralized location so that you can store essential equipment close by. If you are going to use your shed for gardening, make sure it is close to your garden or greenhouse. There are two main factors that will determine its size – an effective work surface as well as the need for storage. For your shed to cope with frequent use, you will also need to install hard surfacing and pathways that lead to the rest of the garden. If you are only going to use your shed to store tools, materials, and machines, it may not be used as frequently. For instance, if are going to store your lawnmower in there, you will only use it about once a week in the spring, summer, and fall. Similarly, if you are storing garden furniture or a barbecue in your shed for the winter, you won’t see it until spring or the summer. If the barbeque is sizeable and has wheels, you may want to have some sort of path so you can roll it back into position when the winter cold dissipates. Usually, sheds are made from timber, namely softwood. They are available in prefabricated panels which you can bolt together. Roofing felt or asphalt sheets are used to cover the roofs. Larger sheds are known to be either made from brick with slate roofing or tiled with shingles. Smaller sheds which are mainly used as garden sheds are typically used for storage, usually have a typical mono-pitch or central-ridge roof. The larger the shed, the more the possibility of using it to harvest rainwater. There is a new trend that has been doing the rounds, namely green roofs. Green roofs involve covering the roof of a shed with low-maintenance plant. This not only increases biodiversity and has particular advantages to wildlife, but works to keep sheds warmer in winter and cooler in summers. Green roofs also work to conceal the structure. Turf or sedums are the best choice mainly because of their shallow rooting needs. It is easy to find large mats that these species of plants are already pre-planted in, which homeowners can simply cut according to size and fit it onto their roofs. Stain your shed in a darker color if you are planning on making it look less obtrusive, allowing it to fade into the background. You can also create a false boundary by way of installing a trellis screen around your shed. 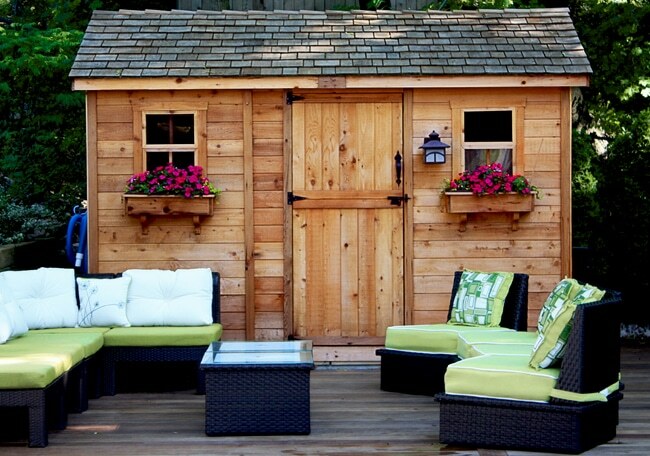 While some homeowners choose to conceal their sheds, others wish to show them off. Showpiece sheds, which are more decorative and artistically appealing in nature, are fairly common these days. There are many summerhouses available in the market which can also double up as a shed and are especially useful as a hobby room or a retreat room. These humble structures are transformed into focal points and topics of conversation with the help of painted finishes, decorative timber work, and classic window treatment. There are some contemporary sheds available that have sleek glazing, blond wood panels, and aluminum or sharp steel detailing, which go well with urban gardens. If you have a smaller space in your garden, you may want to consider off-the-peg storage solutions such as shelved cupboards or covered boxes. These are usually made from fiberglass sheets and are large enough to provide ample storage opportunity for smaller garden tools. To reduce its impact, make sure to choose darker colors. You must give the security of your shed a careful consideration, especially if you are storing something of value in them. The more valuable the items stored in your shed, the higher the need for adequate security. Since the loss of equipment stored in a garden shed is usually not covered by household insurance, make sure to use locks and make sure it keeps the moisture and wetness out.